Gold Medal Mania Video Slot Guide & Review - Casino Answers! Gold Medal Mania is a 5-reel, 25-line video slot developed by Random Logic featuring two wild symbols, scatter wins, multipliers and a bonus game. You can play the Gold Medal Mania at Bovada. Bets on the Gold Medal Mania slot machine are $0.05, $0.10, $0.25, $0.50, $1, $2, $5 and $10 per line. You can select up to 25 paylines on a spin in Gold Medal Mania. You can bet anywhere from a penny per spin up to the maximum total bet of $250 per spin. Gold Medal Mania has a great betting range that is suitable for both casual players and high rollers. You can play the Gold Medal Mania slot game by selecting your bet and pressing the “Spin” button. You can also play all 25 lines by using the “Max Lines” button to spin the reels. 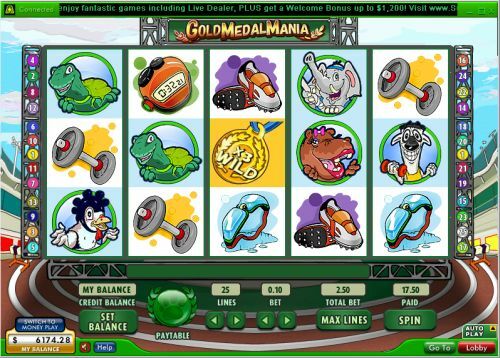 The highest paying symbol on the Gold Medal Mania online slot is the Turtle symbol. 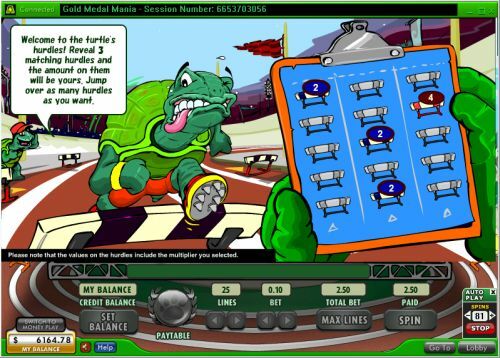 Land 5 Turtle symbols on an active payline and you will win the 1500 coin top jackpot. The second highest paying symbol is the Chicken symbol, which can pay up to 500 coins. The Torch symbol is the scatter symbol on the Gold Medal Mania slot game. 2, 3, 4 or 5 Scattered Torch symbols will pay out 1X, 5X, 50X or 500X your total bet. The Silver Medal wild symbol will substitute for any symbol except for the scatter and bonus symbols. The Gold Medal wild symbol will also substitute for the same symbols and will act as a 3X multiplier. The Gold Medal symbol will only appear on the third reel. All symbols pay left to right on consecutive reels of an active payline, except for the scatter and bonus symbols. All wins are multiplied by the bet per line, except for scatter and bonus wins, which are multiplied by the total bet. Scatter and bonus wins are paid in addition to payline wins. Only the highest win is paid on each of the active paylines. Open up the Gold Medal Mania autoplay mode by pressing the Up arrow on the “Auto Play” box. You can play up to 99 autoplay spins on the Gold Meal Mania video slot. You can stop the autoplay mode at any time by pressing the “Stop” button. Gold Meda Mania has a nice little bonus game as well as some chances to multiply your winnings. It also has a cute theme that animal lovers can enjoy. You can play the Gold Medal Mania video slot at Bovada. Can players from the United States play the Gold Medal Mania video slot for real money? No, American players cannot play the Gold Medal Mania slot game for real money. For a better selection of Olympic-themed slots, please read our list of sports themed slot games.